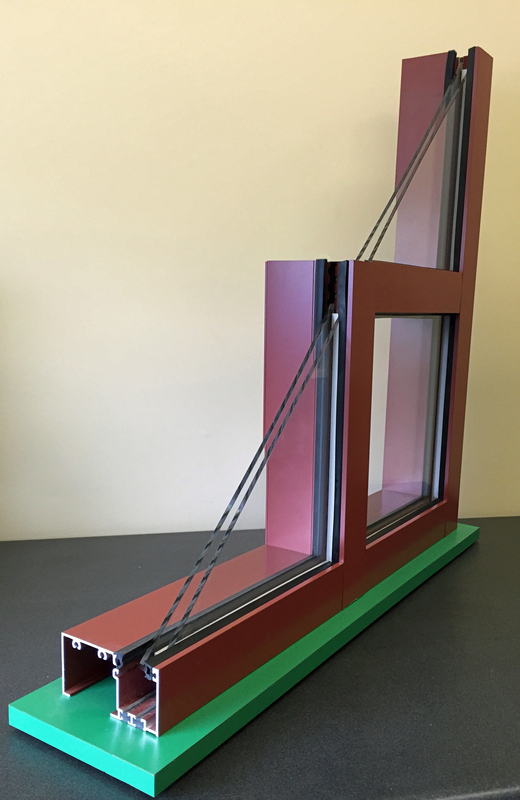 Tubelite Inc. adds a new 900RW Series ribbon windows, with single and dual poured-and-debridged thermal options, as part of its growing Therml=Block™ product line. "Designed for strip window applications in low- to mid-rise commercial buildings, 900RW ribbon windows save installation time and labor, while meeting model energy codes and supporting LEED® certification," said Mary Avery, Tubelite's marketing director. "Even in extreme cold climates, Therml=Block products provide superior energy and condensation resistance performance using multiple thermal barriers, while providing structural integrity and aesthetic flexibility." Tubelite's 900RW ribbon windows have been successfully tested per the National Fenestration Council (NFRC) 102-14 procedure, achieving a U-Factor of 0.30 for thermal transmittance. They also successfully were tested per the American Architectural Manufacturers Association (AAMA) 1503-09 standard, achieving a frame condensation resistance factor (CRFf) of 72. The single and dual thermal break options allow designers to select appropriate thermal performance levels to meet their projects' requirements. Glass is positioned at the exterior of Tubelite's frame and installed from the interior side. Azon's Lancer™ mechanical surface conditioning of the aluminum extrusion cavity ensures long-term resistance to shrinkage of the polyurethane barrier. The new 900RW Series high-performance, 2-1/4-inch-wide thermal framing is available in depths of 4-1/2 or 6 inches. Options are offered for slab edge covers. These ribbon windows may be specified as part of a complete offering of Therml=Block entrance, storefront and curtainwall systems, or individually as needed. They also are compatible with Tubelite's aLuminate™ light shelves and Max/Block™ sun shades. The aluminum used to produce all of Tubelite's framing systems, light shelves and sun shades can be extruded using EcoLuminum™, a high recycled-content aluminum billet composition. The aluminum is finished in a choice of seven anodized finishes or 20 standard paint colors, or, upon request, blended and custom colors may be specified. Durable finishes reduce buildings' maintenance costs and enhance long lifecycles. For an AIA-approved continuing education course on "Product Selection for Aluminum Fenestration" or other presentations, please email dependable@tubeliteinc.com or call 800-866-2227. Filed under: AAMA, Products, Tubelite Inc.